Reverend William Henderson opened Ballarat College on Wednesday 6 July 1864 when two seven-year-old cousins presented themselves at his church, St Andrew's Presbyterian. On the following Monday morning they were joined by three other boys to become the first students of the school. Elizabeth Kennedy, the wife of another Presbyterian minister, came to Ballarat to live and in 1876 she began a cottage school for her children and the daughters of family friends. This was the beginning of what became known as Mrs Kennedy's School for Girls, later to become Clarendon Presbyterian Ladies College. The school history has been documented in two publications by Phil Roberts on 2004 and 2014 respectively - Golden heritage: history of ballarat and Clarendon 1864 - 2004 and a companion volume Ballarat Clarendon College: One hundred and fifty years. These books are available for sale from the school. The collection documents the history and development of the school for present and future generations. It comprises both school records and museum items. Hi Greg, thank you for your enquiry. Athletic Sports carnivals were held annually at Ballarat College, often at the same time as old collegians annual reunions and always with some races exclusively for 'old boys'. From 1884 College Cups were donated by the Old Collegians Association for the outstanding athlete amongst present boys and past boys. Handicap races were run over 120, 250 and 440 yards to obtain the results. 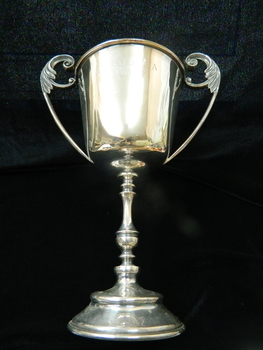 In the first year Thomas Thompson won the old boys cup. Robert Cameron entered Ballarat College in 1885. We cannot confirm his year of leaving but going by his age (Birth: 13.10.1871) we expect he would have left before 1891 so that would put him in the old boys category. 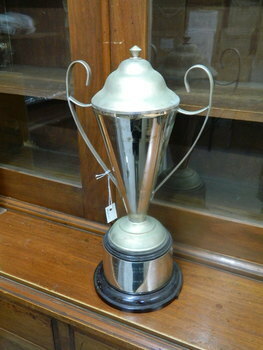 Our school archive holds examples of Old Collegians Cups from this era. They were extremely ornate as you will see from examples catalogued to Victorian Collections. However we do not hold personal medals relating to the cups themselves. If you were able to forward a photograph of the medal's inscriptions I would be most grateful. Each volume is bound in brown half calf and marble cloth, college crest embossed on front cover with six raised bands on spine with gilt decoration and gold lettering on the second and third bands. End papers and edges marbled, volume I has a black and white frontise piece. Slight foxing on pages. 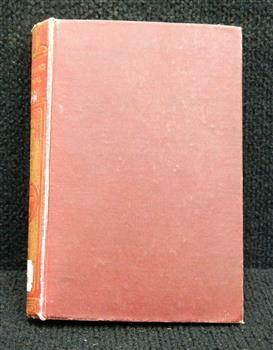 Book plate only on Volume I. Volume I (000147.1): 768 p., volume II (000147.2): 803 p., volume III (000147.3): 828 p.
The three volumes were awarded to Fanny Cadden in 1882 for a Wanliss Prize in History in the sixth form. 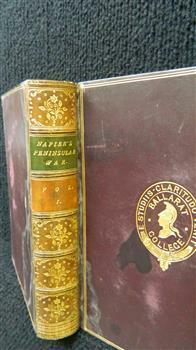 Fanny entered Ballarat College in 1879 at the age of 13. Her brother, Charles, entered in 1881 at the age of 14. In the original register parent/guardian is listed as Simon Cadden, and the address as Alfredton. During 1877 - 1891 Ballarat College accepted enrolments from female students. The school holds the original register of this period and notes that Fanny Cadden entered the school in 1879 at the age of 13. Presbyterian educators placed great value on a classical education matched with diligence in study. Book prizes were highly regarded and academic success admired. In the school’s early years prizes were ordered direct from London and had the school crest embossed in gold on the front or back cover. Many of the prizes given in early years were returned to the school to equip the Weatherly Library when it opened in 1936. 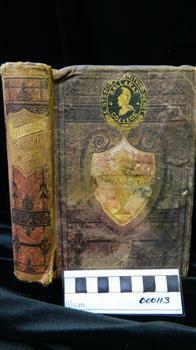 Book plate inside Volume I front cover: college crest/ History/ Wanliss Prize,/ Sixth Form./ Awarded to/ F Cadden/ CHRISTMAS, 1882. Example of ongoing community support of the school. The Weatherly Library was opened in 1936 and its collection significantly established by donation or bequest of old collegians and members of the college community and associates. The 1920 Club agreed to have a working bee at Wanliss House to remove fittings for sale from the house before it was demolished. This program was found down behind the mantle of one of the fireplaces. 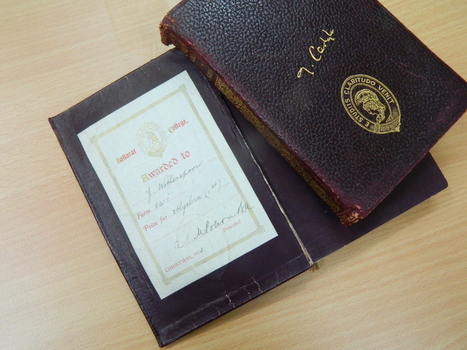 These two books are the only surviving examples of a set of books donated to the CPLC library in honour of former principal Miss S Lillie Crump. Annual trophy awarded to the winning Year 10 & 11 team in the Royal South Street Society MARS debating challenge. John Oddie's (1974) appointment as deputy commander of Aussie forces in the Middle East capped a remarkable career of service to Australia. Sadly, this honour also involved the heartbreaking duty of informing families of the deaths of their husbands and sons in Afghanistan and overseeing departure ceremonies for the fallen soldiers. 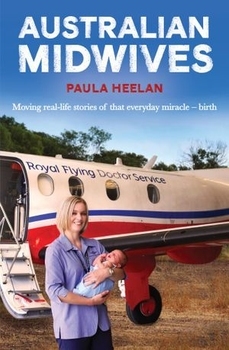 As well as covering the war in Afghanistan, Flight Command provides an insider's account of being a combat pilot in the first Gulf War, a commander supporting peace in Bougainville and security in Cambodia and the often harrowing experience of being a first-response commander dealing with the aftermath of the Boxing Day tsunami in Indonesia. 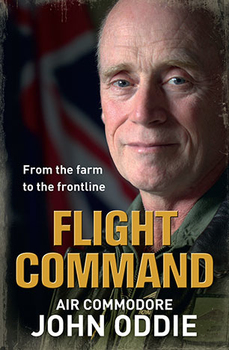 By turns heart-warming and poignant, Flight Command is the story of a farm boy who managed to carve an international career in the military that included service in two wars. 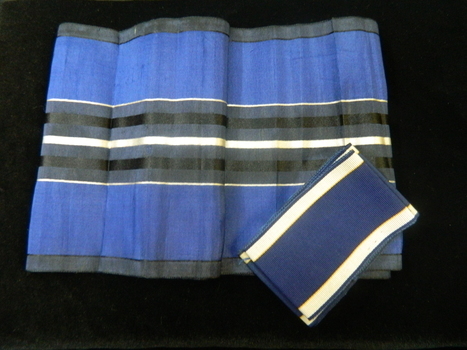 Wide silk sash featuring narrow black border, centre band of various widths of black and silver and wide side bands of navy blue. 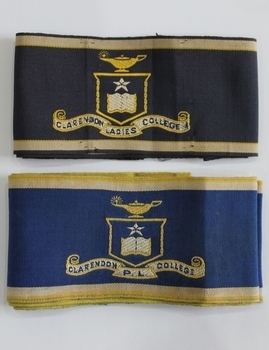 Sash thought to have been worn by Clarendon Ladies College old collegian in 1910s. The sash was donated by Berenice McDade on behalf od Gladys Forsyth (CLC 1919) and Dorothy (Johns) Lawrence (CLC 1918). 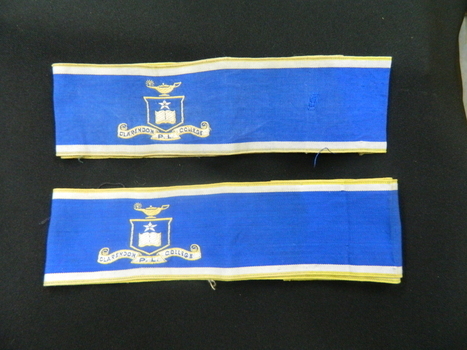 The sash is accopanied by two rolls of school ribbon featuring navy centre band with fine gold edge and white border. Designed by Caselli for Ballarat College, this building was built on the corner of Lyons and Sturt Streets adjacent to St Andrews Kirk. 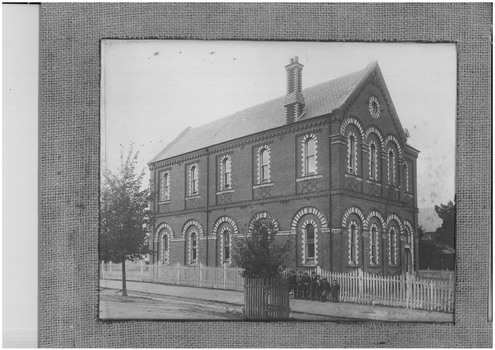 The school used these premises until moving to current senior campus premises at 1412 Sturt Street. Photograph features southwest faces of building, surrounded by a picket fence; seven young boys are standing in front of fence along Lyons Street side. This Form IVA & Romove third term (end of year) report was issued for Jean Wilson in December 1929 and signed by CPLC Principal, Lucy Shaw. The report details subjects studied and gives student percentage, class average, cohort total, position in class, personal comment and examination/term marks. Other management of earning indicators include conduct, homework, detentions and attendance. This report has social significance because it gives indication of educational standards and expectations of the era. Round disk cast in bronze gunmetal, which incorporates the following; an image of Britannia holding an oak spray with leaves and acorns, an imperial lion, two dolphins representing Britain's sea power, the emblem of Imperial Germany's eagle being torn to pieces by another lion. The medallion is packaged in a heavy card envelope. 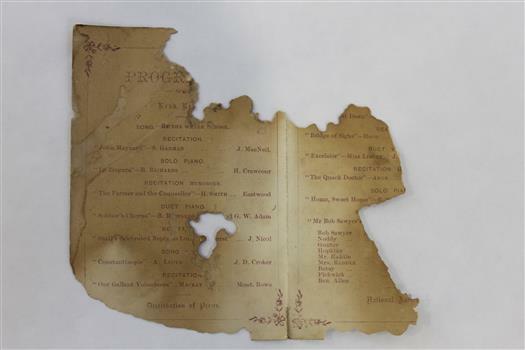 The WWI Death Plaque (Dead Man's Penny) was issued to the next of kin of servicemen/women who had fallen in the Great War between 1914 and 1918.This plaque was given to honour the service of Ballarat College old collegian Harry Spencer Holgate who entered the school in 1894. On leaving school he became an auctioneer at Muswellbrook and Scone. He enlisted on 24 May 1916 and was awarded the Military Medal at Polygon Wood in September 1917. He was killed at Zonnebeke on 11 October 1917. His brother Edward Spencer Holgate was also killed while serving his country during World War 1. Of the 305 Ballarat College old collegians who enlisted in WW1 65 gave their lives for their country. This 'death penny' is representative of the incredible sacrifice given by this huge percentage of the school's community. Inscribed around face of medallion: He died for freedom and honour. 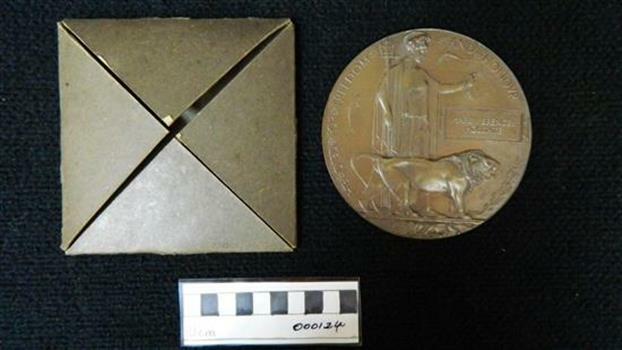 A rectangular tablet cast on front of medallion inscribed 'Harry Edward Spencer'. The board honours the premier basketball team for senior and junior house teams from 1978 - 1989. It lists individual team premiers for junior girls, junior boys, senior girls and senior boys and an annual aggregate. The board emphasizes the value placed by the school on both sporting and team (house) endeavour. Hat bands were sewn tobrown winter felt hat or straw summer hat with school crest facing to the front. These bands were donated to the school by Joan Aked (CPLC council member 1973-1976) and mother of Rosemary (Aked) Hamilton (CPLC 1969) and Bronwyn (Aked) Sanders (BCC 1974). 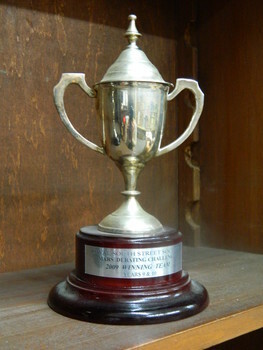 Perpetual Cup awarded to the winning school in the U-17 Lap of the Lake competition 1957 - 1977 and 1980. 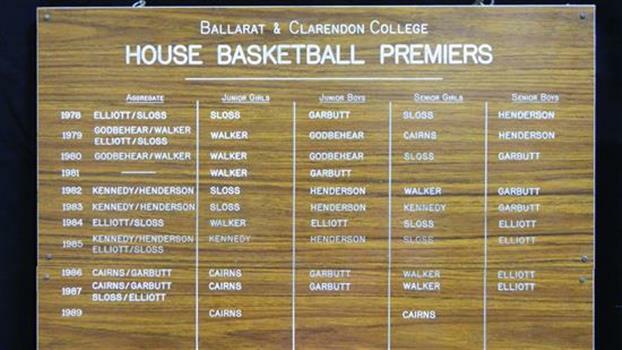 Ballarat Clarendon College won the trophy 1980 only. Presented to the school by Mrs W Paterson in 1948. Possibly wife of old collegian W A Paterson (1925 peer year) wh served on the Ballarat College Council 1960-71. Example of ongoing commmunity support of the school. The Weatherly Library was opened in 1936 and its collection significantly established by donation or bequest of old collegians and members of the college community and associates. 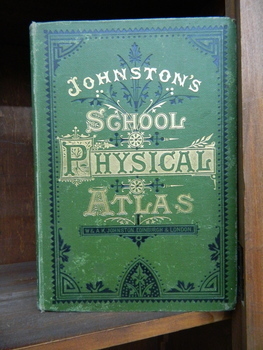 Books donated to the Ballarat College Library by Dr W R and Mrs Griffiths, Dr W R Griffiths and John Garland Griffiths. These are all members of the one family. John Garland griffiths entered ballarat College in 1938. [Family Links] Son of Mr W R & Dr Mary Skewes | [Family Links] Brother of Bruce, Margaret & David | [General] Previously at Winton College to Gr 4. Two books were donated in 1941 and a third in 1957. 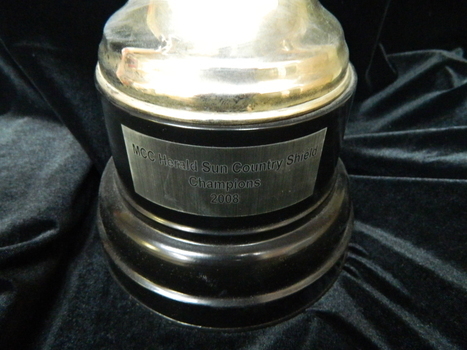 Trophy awarded to Ballarat Clarendon College in 2008. Since its inception in 1976, the Herald Sun Shield has grown to include four levels of competition: AFL Victoria Herald Sun Shield, AFL Victoria Herald Sun Country Shield, AFL Victoria Herald Sun Country Cup, AFL Victoria Herald Sun Senior Girls Shield. To date Ballarat Clarendon College have won the Country Shield 2006 - 2010. Silver coloured maltese cross medal with decorative link attached to top and engraved on both sides. The medal was awarded to Trooper Whyte of the Prince of Wales Victorian Volunteer Light Horse (Ballarat) in 1877. 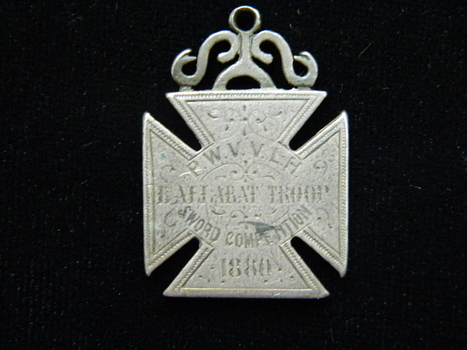 The medal was awarded to Trooper John Garbutt of the Prince of Wales Victorian Volunteer Light Horse (Ballarat) in 1880 for attaining fourth prize n the sword competition. In 1862, the units of the Mounted Volunteer Corps in Victoria were formed into a single regiment known as the Victorian Volunteer Light Horse. This title changed again in 1863, to the Prince of Wales Victorian Volunteer Light Horse ( Hussars ). In 1870 a uniform was adopted that was based on the British 19th Hussars. Troops were based at various times at Geelong, Ballarat, Kyneton, Bendigo, Castlemaine and Dandenong, as well as metropolitan Melbourne. In 1885, most of the Cavalry were incorporated into a newly formed Victorian Mounted Rifles. (http://www.awm.gov.au/collection/REL/18070.001) John Garbutt was Principal of Ballarat College 1877 - 1909. He was educated at Geelong National Grammar School and in 1860 was the first dux of the college. He was educated at Geelong National Grammar School and in 1860 was the first dux of the college. Fist class Honourman Arts and Laws at Melbourne University 1866; Two years a master at Geelong College; seven years master and three years senior master at Scotch College, Melbourne. Mein's 1964 History of Ballarat College states: 'To summarise, it may be fairly claimed that the College's War Record in 1914-1918 would have reflected great credit on a school with ten times its numbers...Some of the credit of the college war record must be attributed to the influence of Major John Garbutt, M.A. who was Principal of the College for 33 years...Nearly all the old Collegians who distinguished themselves in the war had been trained by him. Shirley Flower Ramsay attended CPLC 1935 - 1945; sister of Margery and Robert. 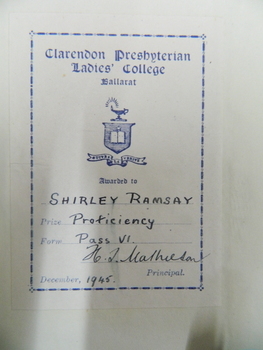 Book plate inside front cover: Clarendon Presbyterian / Ladies College / Ballarat / school crest / Awarded to / Shirley Ramsay / Prize Proficiency / Form Pass VI / H I Mathieson / Principal / December 1945. Book - History of the war in the penisular and in the South of France from the Year1807 to the Year 1814. Volume I. Book prize given to John Tanner (1887), Christmas 1885. First prize for French in the Upper Fifth form. Tan cloth covered book with gold and black lettering and illustration on cover and spine. Titled 'The French Revolution Vols 1 & 2' these books were gifted to John (Jack) Felix Wotherspoon for excellence in Arithmetic and Algebra. Jack was born 24 June 1897 at Beaufort and joined Ballarat College in 1911. Jack left school at the end of 1914 and joined the Navy and served as a wireless operator. Following the war Jack was a draper in Beaufort from 1919 until 1949. 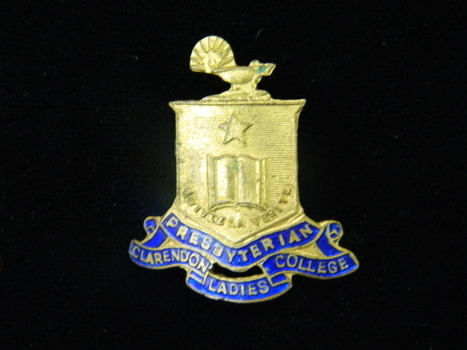 School badge for Clarendon Presbyterian Ladies College 1921 - 1973, donated to the school by Michael Dunn. Michael's mother and aunt (unidentified) both attended CPLC in the 1930s. The badge worn worn as a tie-pin or fixed to the entre of the tunic bodice. It is possible the gold badge was for senior students or prefects only and the silver badge for other students. Hat ribbon with embroidered crests; one navy ribbon with white border and yellow/white embroidery. One mid-blue ribbon with white border and fine yellow edge border, white and yellow embroidery. Four brass plaques featuring fine border and inscription. The plaques originate from chairs donated towards the furnishing of the Mair Street premises of the Clarendon Presbyterian Ladies College opened 1926. The chairs were situated in Watson Hall. The chairs were donated by the Old Collegains Dramatic Society which commenced with an inaugural production 1 October, 1925. 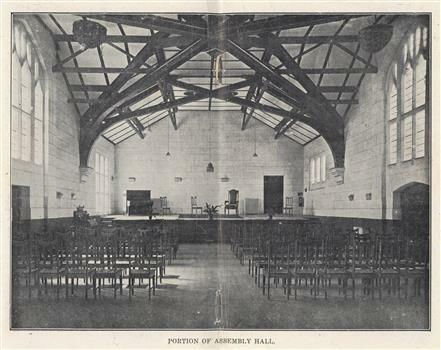 The Touchstone December 1925 records the performance took place in the St Andrews Hall begining with a comedy sketch entitled 'Such is fame'...the second half of the programme consisted of what was described as 'a Pot-Pourri of Old Fashioned Tunes'. Prize awarded to George G Morrison (birthdate 3/2/1862) for excellence in Algebra and Geometry in the first form; George entered the school 23/8/1877 and left less than a year later on 1/7/1878. Very early example of an academic prize awarded by Principal John Garbutt (1877 - 1909). 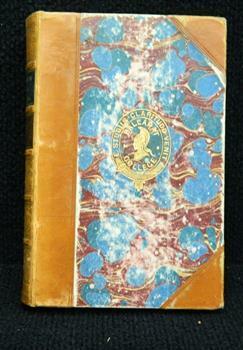 Bound in brown cloth with gilt decoration and inscription on spine. Floral end papers, detached papers, slight foxing on pages, 664 p.
This book was awarded to Lilian Jane Tweedie in 1893 for First prize in Latin (Preparation). Lilian enrolled in Clarendon Ladies' College in April 1891. In the original register it lists parent as William, occupation Barrister and residence as 58 Doveton Street, South Ballarat. Lilian's sibling attending Clarendon Ladies' College is Sarah Florence (enrolled 1884). Siblings attending Ballarat Clarendon College are George (enrolled 1889) and Arthur (enrolled 1885). Presbyterian educators placed great value on a classical education matched with diligence in study. Book prizes were highly regarded and academic success admired. In the school’s early years prizes were ordered direct from London and had the school crest embossed in gold on the front or back cover. Many of the prizes given in early years were returned to the school to equip the Weatherly Library when it opened in 1936. 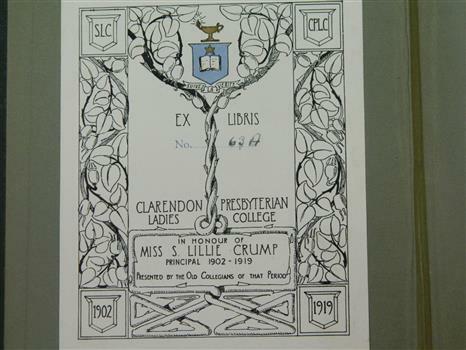 Book plate inside front cover: Clarendon Ladies' College,/ BALLARAT./ First Prize./ Latin (Preparation) Class III/ Awarded to/ Lilian Jane Tweedie/ REV. R. KENNEDY,/ PRINCIPAL./ December, 1893. Stamped on fly leaf: "BALLARAT COLLEGE NOT TO BE REMOVED FROM LIBRARY" Donation label on fly leaf: Literature./ College emblem/ Ballarat College Library/ PRESENTED BY/ Miss E. Tweedie/ &/ Mr F. Tweedie 1947/ PLEASE REPORT ANY LOOSE LEAVES, ETC.